Astrophotographers watch for transits of the International Space Station across the face of the sun or moon. This one happened on eclipse night, as seen from Texas. View larger at EarthSky Community Photos. | Michael Castles in Tarrant County, Texas, wrote: “January 20 was the big night for the lunar eclipse, and I noted that the International Space Station (ISS) would transit the moon earlier in the evening. Found what looked to be a good location and drove there, set up and waited for the ISS to appear. 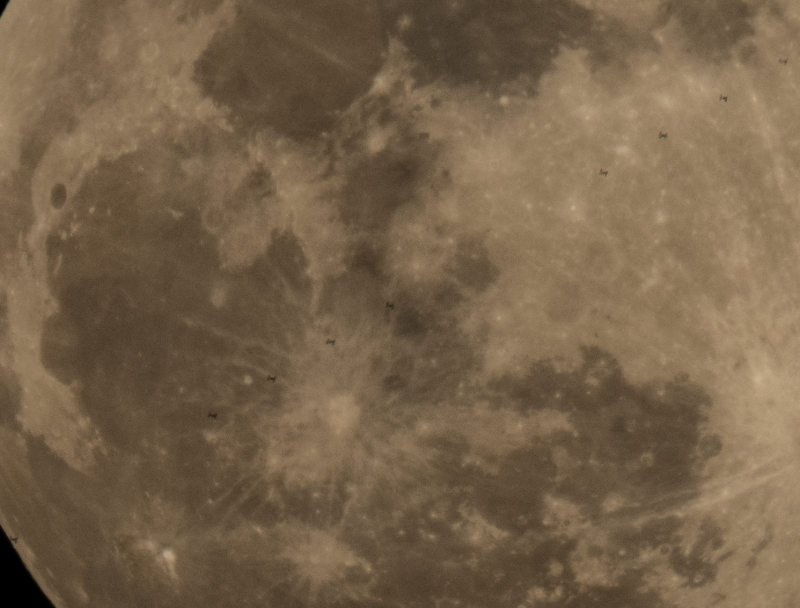 The reflection of the sun off the ISS faded before it would transit the moon, so I started a short burst of images when I thought it would transit and was lucky to catch 9 images. The breaks in the pattern in this image are a result of the pause between burst. Did not want to run a steady burst and fill the buffer on the camera up and miss the transit completely.” Thank you, Michael!